At any given time there are several different offers and versions of the American Express Platinum Card. Usually, the card comes with an annual fee of $450-$475 depending on the version. Did you know that there is an offer that waives the first year annual fee and still gives a bonus of 25,000 Membership Rewards points? 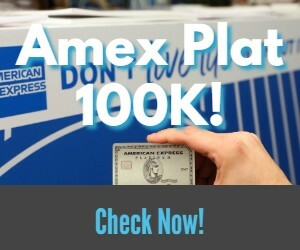 American Express has long had an offer for their Platinum Card for Ameriprise Financial clients. This card in reality has all of the same benefits of the regular Platinum Card including lounge access, a $200 airline fee credit, SPG Gold status & more. Since the Amerprise version of the card waives the $450 annual fee the first year, American Express has not offered a sign up bonus with it in the past. Last year Gary from View From The Wing reviewed all of the publicly available offers for the American Express Platinum including the Ameriprise Financial card. (Without a bonus.) He concluded that the Mercedes Benz Platinum card which gives 50,000 Membership Rewards points after $3,000 in spending during the first three months was the best offer. That argument is moot now I believe since American Express recently upped the bonus on the Ameriprise card from ZERO Membership Rewards points to 25,000 after $3,000 spend through. The annual fee continues to be waived as well. The Ameriprise version of the card also has two additional benefits to it. Usually there is a $175 fee for up to three additional cardholders with the Platinum card. In the first year, this fee is waived as well on the Amerprise version. Currently the best offer for the regular Platinum card has a 40,000 point bonus with a $450 annual fee and the previously mentioned Mercedes Benz Platinum card has a 50,000 point bonus with a $475 annual fee. In my opinion, giving up the extra Membership Rewards points to save the up front annual fee is worth it. This card has all of the same benefits as the others and in addition to the regular annual fee, the additional cardholders are free for the first year as well. In my opinion it is an incredible value. Most people value Membership Rewards points at about $.02 each. With this valuation, lets take into account the value you receive in tangible dollars. We will assume that no one has Global Entry and that there will be 3 additional cardholders. 1st Year Cost: $650 including 3 additional cards. 1st Year Cost $625 including 3 additional cards. 1st Year Cost $0 including 3 additional cards. In the past without a bonus, the Ameriprise version didn’t stack up against the other two. Now with a 25,000 point bonus plus a waived annual fee and no fee for additional cardholders the first year, it is a clear winner. All three versions of the card have other benefits like lounge access, roadside assistance, concierge, rental car coverage, free Boingo internet, elite status & more that are worth additional money as well. Historically, there is ample evidence that people without an Amerprise relationship have been able to get this offer. With that said, there is always a chance that American Express can enforce this language. Based on five years of evidence and the experiences of a few people I know personally, they have yet to do so. Here are the main points of the offer. Limited Time Offer: Get 25,000 Membership Rewards® points after you spend $3,000 in purchases on the Card within the first 3 months of Card Membership. Offer expires on 8/31/2014. 5,000 additional Membership Rewards® points for every $20,000 in eligible spending, up to 30,000 additional Membership Rewards points annually. $200 Airline Fee Credit which some say can be redeemed by purchasing airline gift cards. For a full list of card benefits visit their website. From time to time people are targeted for 100,000 point offers. These may be a better deal, but you have to receive one first. Additionally, for those who already have a lot of points and miles, it may be more beneficial to save the cash up front rather than get the extra points. Since there hasn’t been a publicly available 100,000 point offer in 1 1/2 years, I wouldn’t hold my breath and wait for one. To be honest, even if I had a 100,000 point offer, I still would consider this offer in order to save the up front money, but it would be close. There is no doubt in my mind that this offer for the Ameriprise American Express Platinum card is the best out there. If you are an Ameriprise client then I think getting this card is a no-brainer. If not, you have to decide whether it is worth giving it a shot. Like I said, I know several people who haven’t had an issue with applying and receiving their cards. You can get the full details of the offer and apply for the card here. Have a great week! Disclaimer: I do not receive any commission for links in this post. Thanks Geoff. It has been corrected. It is funny how I can read the post 10 times and miss the error over and over. I appreciate it. I don’t think I have any other AMEX cards with membership rewards points. Do you have a link for a synopsis of how you get to a 2-cent value on the points? And even at 1.25x points at $20k+, I’m assuming this card would be down a ways on the list of cards you’d use for everyday spending (after the initial minimum spend)? Along those lines then, would this be a likely card to be cancelled before the one-year mark? I already have a handful of AMEX cards (Costco, Simply Cash Business, Blue Cash Preffered, and Delta). Assuming good credit, do you know if there’s a max number of AMEX cards one should go for (and probably just a few applications per year)? Thanks, as always, for the great info! You are correct that this wouldn’t be the best everyday spend card. The main reason to get this card is for the amazing benefits, especially with the annual fee waived. I would most likely cancel rather than pay a $450 annual fee, especially since the card has lost some benefits lately like AA lounge access. The general consensus for the maximum number of Amex cards is 5. I have read some people say 4, but I personally know a few people who have five. Apparently some people have even had more than five, but I haven’t seen this widely reported. My guess is that they base it on your relationship with them, credit and income. As far as the points valuation, I don’t have a write up about it, but I could certainly do one. I am just basing that on what others have written and my own personal experience. In fact, historically I have been able to get slightly above $.02 value on my redemptions. Often times American Express has transfer bonuses as well which bolster their value. Every blogger has an opinion and they usually value them at 1.6 to 2 cents each. Thanks for the reply. Good to know about the 4-5 AMEX cards. Does it matter if they are personal versus business, or still the same 4-5 total/combined? I just realized that at least one of our cards is in my wife’s name as primary, so that gives me some room (assume it’s 4-5 per person, not household – assuming both have good credit). Have you had success canceling AMEX cards before the annual renewal, and then still being able to apply for another AMEX card (always keeping your total up around 4-5)? I found this (http://creditcardforum.com/blog/american-express-rewards-point-value/) via a quick Google search. Looks like the primary value of AMEX MR points is the flexibility of transferring them (on a 1:1 basis) to whatever airline or hotel you value (or have the need for) the most? Thus, 2 cents seems reasonable. So ~$500 in points/miles + $200 credit + benefits (for the year) … with no annual fee (first year) … seems like a great deal! Yes the best value is definitely on transferring to airlines. Based on the people I know, the 4-5 cards does include business cards, but it all seems to be YMMV. I have had success cancelling and then applying for another card pretty soon afterwards, but not right away. If I added my wife as a secondary cardholder for this card (when I apply), I’m assuming it would not “count” against her as an AMEX account? Said another way, it wouldn’t count towards her limit of 4-5 AMEX accounts or necessarily preclude her from applying for this same card (although, if she did, we’d probably wait to have her do it until closer to the 8/31/14 expiration of this deal). Shawn, does one need an Ameriprise account to open this card? If not, the airline credit and Centurion access alone makes this virtually a no-brainer. Nevermind. If I would actually read the WHOLE post I would understand. My bad. Hello – thanks for the post. Do you know if the $100 global entry application credit also applies to the 3 additional cardholders? Thanks! It does. You get a $100 credit per card each 5 years. Wow. That’s a sweet deal. Thanks. Great post Shawn! I’ve been waiting for the right opportunity to get a Platinum Amex, and this is it. Especially since the offer contains my favorite 4 letter word…free. I applied straight away and my status read “application received”, stating I would receive news by mail w/in 10 days. Any advice on a number to call and follow up, or since I’m not an Ameriprise customer should I just be patient to avoid any red flags? I would probably wait. American Express usually takes a day or two to process the application. If you want, you could call their application status line to speak with someone at (877) 399-3083. With that said, my advice would be to at least wait a couple of days. Thanks Shawn. I’ll wait and then call on Thursday under the guise of having forgotten to add an additional cardholder. Got my approval this afternoon via email. Thanks again for the great post, and the sage advice about waiting. Now I get 25,000 MR points, a $200 travel credit this year and next plus global entry all for the price of…free! I’ll make certain my wife applies before the deadline too. Today would’ve been perfect, if only team USA had gotten by Belgium. Oh, and I forgot about lounge access. Too much free stuff to remember.